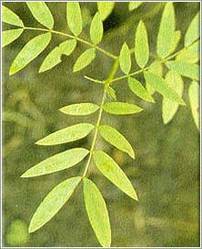 Common Name : Senna, Indian Senna, Tinnervelly Senna, Cassia Senna. Part Used : Pods, Stems And Leaves. Habitat : Cultivated in dry lands of southern & western india, and indegenous to arabia. Uses : It is recognised by British and US pharmacopoeias. It is useful in habitual costiveness. It lowers bowels, increases peristaltic movements of the colon by its local action upon the intestinal wall. It is used as expectorant, wound dresser, antidysentric, carminative and laxative. Useful in loss of appetite, hepatomegaly, spleenomegaly, indigestion, malaria, skin diseases, jaundice and anaemia. Leaves are made into a paste, and applied to various skin diseases.